With OTAs starting next week, Indianapolis Colts expected starting safety Clayton Geathers is still rehabbing from the injury that sent him to injured reserve after Week 11 last season. Geathers’ 90.3 run-defense grade was tied with Harrison Smith for sixth-best in the NFL last season. 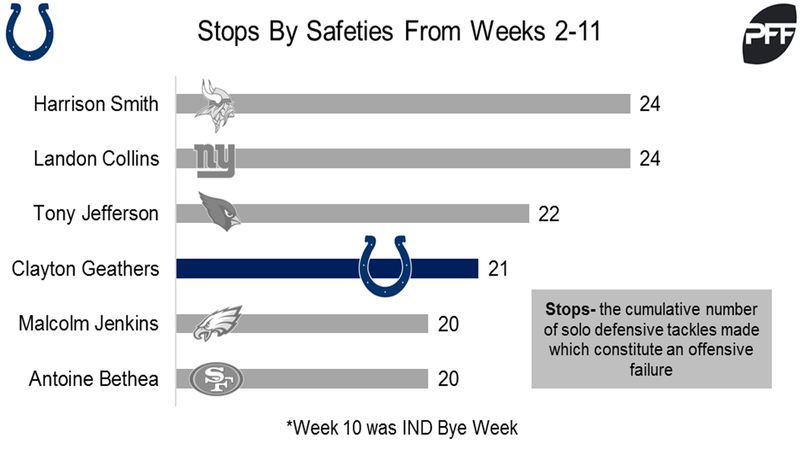 The second-year safety’s 9.1 run-stop percentage in 2016 was best on the Colts and sixth-best in the NFL. The Colts’ in the box safety only started Weeks 2-11, but he led the league in tackles by a player to play less than 600 snaps with 53. Geathers also had the fourth-most stops, the cumulative number of solo defensive tackles made which constitute an offensive failure, during that span.